Colombia’s foreign ministry has ousted and repelled freelance foreign journalists simply by failing to grant them the visas they need to work. Over the past week, The Bogota Post and Colombia Reports have made an inventory and gathered testimonies of foreign journalists and correspondents who have been unable to obtain or renew a migrant visa. The result is a shocking document that reveals not just how many legitimate journalists have been given the runaround instead of their necessary visas, but also that Colombia’s Foreign Ministry is either an embarrassing chaos or an evil machine. What good are you to Colombia? Over the past two decades, media outlets have sacked the vast majority of their foreign correspondents. As a consequence, much of the news you receive from Colombia comes from freelancers. Colombia’s Foreign Ministry knows this because whenever we, for example, report that both former President Juan Manuel Santos and President Ivan Duque have been implicated in the Odebrecht bribery scandal, it’s the foreign ministry that has to deal with the fallout. 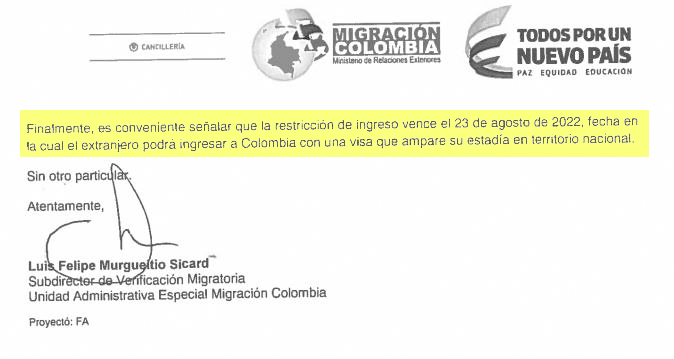 Colombia’s Migration agency falls under the Foreign Ministry and, since December, has failed to give migrant visas to freelance journalists and correspondents to the best of my knowledge. At this very moment, at least 12 journalists are in trouble. Three have given up and left Colombia. These journalists have reported for the New York Times, The Guardian, TIME, The Washington Post, Al Jazeera, VICE, Reuters, The Telegraph, The Bogota Post, El Tiempo, Finance Colombia, Bloomberg, Dow Jones Activa, BBC Monitoring, ESPN, New York Daily News, L’Express, Marie Claire, National Geographic, Gotenborg Posten, Volkskrant, De Morgen, Canal+, France 24, RTVB, Nature TV, Vogue, Hohia de Sao Paulo, MSN, Getty Images and Colombia Reports. Some have seen their migratory status demoted from “migrant” to “visitor.” One of our colleagues is stuck in Quito, Ecuador. At least two colleague can’t work or get paid by local employers because they were forced to re-enter the country on a tourist visa. At least one has become undocumented and two are weeks from having to leave Colombia or become illegal in the country where they have lived and worked legally for years. At least one journalist could not get his visa renewed, despite having exactly the right university degree and complying with all other requisites that allowed him to extend his visa that had allowed him to work for years. Almost all have spent hundreds if not thousands of dollars in administrative fees and other costs that led to nothing but more administrative fees and other costs, but no migrant visa for journalists. The Santos administration “simplified” migration requisites in December. For freelance journalists, this “simplification” means they now, among other credentials, must have a journalism degree. No other type of credential is accepted, not even a masters degree in journalism. Controversially, the academic requisite for journalists was abolished in Colombia in 1998 because it excludes most journalists and thus limits the freedom of speech. Many of the world’s journalists studied their “beat” — Latin American Studies or Economy for example — instead of journalism, or earned their credentials through years or even decades of experience. By effectively banning foreign freelance journalists who are experts on Colombia, the government is preventing qualified and experienced journalists from informing you. Curiously, none of us have formally been refused a migrant visa. Instead we are told that our applications are “inadmissible” or officials come up with other incomprehensible excuses. To use myself as an example; I have no journalism degree, but 20 years of experience. My CV contains an extensive portfolio, multiple journalism courses and recommendations that would be sufficient for a migrant visa for journalists in any “normal” democratic country. Admittedly, I was banned from the country for six months in August last year because I had screwed up and had been in the country without a visa. When I tried to return and resume my work, all kinds of weird things started happening. First I was told by Migration director Christian Kruger’s assistant that my ban was not for six months, but five years. A top migration official falsely informs the Dutch embassy I wasn’t allowed in the country until 2022. When I verified this at the consulate office on the “Golden Curve,” the Netherlands’ most expensive yard of real estate, I found out this was false. I had paid my dues and was allowed back in the country as long as I had a visa. Nevertheless, I was given other run-arounds and was unable to return to Colombia for another three months. I am again working legally in Colombia, but on a visitors visa that will expire on November 30. Do you report on politics? Initially I thought the problems were related to the fact I had been without visa before. But when I finally returned to the country that has been my home for 10 years, my colleagues and I found out we were all facing obstructions. Did some “bobo” confuse himself for a “vivo”? Either Colombia’s chronically corrupt and weak government is ignoring the country’s constitution or Santos’ nepotist clique thought they were smarter than us, or both. This latter would be cute; underestimating the intelligence of journalists while violating their constitutional and possibly human rights is recipe for trouble. Unlike Colombia’s president and Bogota’s mayor, none of us journalists falsified our CVs. Unlike Colombia’s president of Congress, we did finish high school. After more than 140 death threats this year alone, Colombia’s press corps may have been terrorized into self-censorship, but until December last year the international press was relatively free to report on what’s going on in the country. Journalists around the world have defended the freedom of speech before assailants much more powerful than a dysfunctional bunch of “criollo” oligarchs and nepotists, so we decided to fight back. This morning, Colombia’s foreign ministry received a formal petition to meet with the Foundation for the Freedom of Press (FLIP) to explain why consular and migration officials are failing to expedite the appropriate visas to qualified journalists. Collectively, we have filed our complaints with Reporters without Borders (RSF) and the Committee to Protect Journalists (CPJ), who work with the FLIP. To assist and protect current journalists whose migrant status is threatened and who could be forced to leave. To change the requirement for independent visas for journalists and remove the necessity to have a degree certificate, allowing journalists to prove their credentials in other ways. To prevent further unreasonable limits on the independent reporting of foreign journalists on the basis of fundamental and universal freedoms and rights. The European Union will discuss our case this week. Also the United States’ embassy in Bogota has been informed. The United Nations’ human rights agency is studying whether the Colombian government has violated our rights. Next time a Colombian government agency plans to screw journalists who have earned their credentials through merit and hard work, I recommend not doing this through incompetent public officials who got their jobs in Colombia’s dysfunctional state system through nepotism.